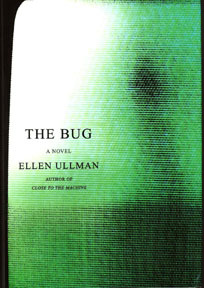 A first novel of unexpected assuredness, The Bug reinvents the story of Frankensteins monster in the no-longer-strange world of computer software developers. Roberta, a Yale Ph.D. is hired as a novice software tester in a Silicon Valley high tech startup company. She stumbles across what appears to be a bug, a clitch in the programming of a new computer. She reports the bug to the programmer who wrote the source code, but, try as he might, he cannot find the bug anywhere in the code he has written. Roberta runs test after test, but also fails to pinpoint the problem — the bug doesnt come up all the time, or indeed under any predictable circumstances. Instead, it pops up unexpectedly, as if it had a mind of its own. A biologist might say the bug was an emergent property of the completed program, not discernable or predictable from its component parts. Human emotions are not predictable from knowledge of a nerve cell, no matter how comprehensive, and in just this way the bug eludes definition. To understand it, you must comprehend the program as a whole. So this is what Roberta sets out to do. The more Roberta studies the program, the more she is drawn to the beautry of the source codes complexity. Is it possible to fall in love with a virtual reality inside a machine? You have to admit, its an interesting permise for a novel. I loved it.